Ride2Roam Home - Africa's best motorbike tours. Combine riding with a safari! Ride2Roam – for the motorbike adventure of your life! Ride where endless horizons leave an unforgettable impression. Where you combine a safari with an unforgettable ride. Ride where mountain passes, sand dunes and salt flats are your extraordinary normal panorama. Where Africa’s wild animals share the road. Where you find the green Okavango Delta in the middle of the Kalahari desert. Where the Victoria Falls thunder. Ride where you see the sun go down in a blaze of orange and the night sky is lit up by millions of stars. Ride where motorcycle tours are different. Definitely Different! 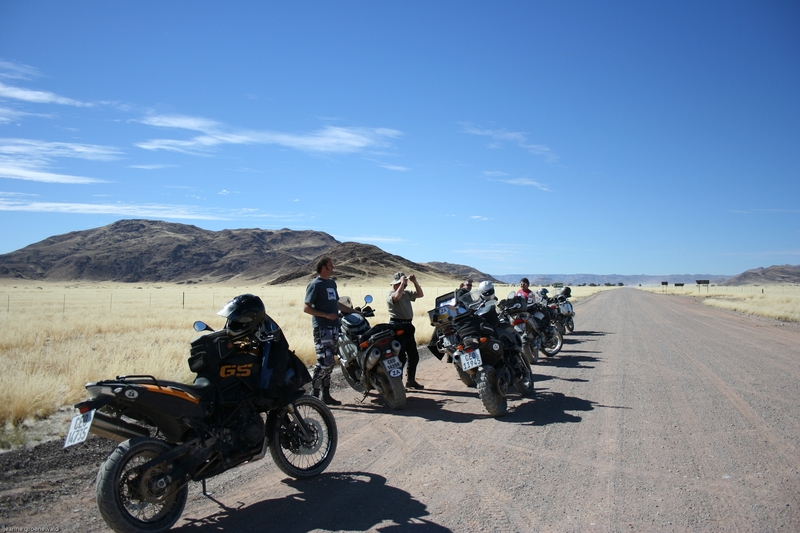 Going motorcycling in Namibia, South Africa or Botswana? Want to ride a motorbike through Africa? Africa has no secrets for Ride2Roam. We will make your motorcycle holiday different. Not just an ordinary motorbike tour. No, during your motorbike holiday we will show you what southern Africa really is about. Different, because our tours are made by bikers for bikers. With us you don’t just book a hotel and a motorbike, but the experience of a lifetime. Different: no mass-tourism, but riding in a small, international group of motorbikers over the best roads in South Africa, Namibia and Botswana. And since you book directly with us you pay no high commissions to a third party. Even our website is different. Made for a tablet it is made to discover us in the comfort of your living room. Yes. Motorcycle tours from Ride2Roam are different. Definitely different! The Okavango Delta, Victoria Falls, Kalahari and Etosha game reserve: you’ll visit all these and more during this motorbike tour! During the day you ride tarred roads to the most beautiful spots of Namibia and Botswana and at night you sleep in carefully selected hotels, lodges and guesthouses. The moment you leave Windhoek you’ll experience the solitude of the Kalahari Desert. Your first encounter with the rich wildlife will take place on a cheetah farm. Your ride then takes you to the Okavango Delta in the middle of Botswana’s desert. Your comfortable tented camp is your base to explore the Delta and close-by Moremi game reserve. Next up is the ‘smoke that thunders’, the imposing Victoria Waterfalls. In Chobe wildlife reserve you’ll board a boat to go looking for hippos, crocs and elephants. Etosha national park is the perfect place for a game drive to find lions, giraffes, rhinos and antelopes. This magnificent motorbike safari is suitable for all riders and perfectly suited to ride with a pillion. Experience what real solitude feels like. See the sky turn orange in an African sunset. Motorcycling through Africa is the experience of a lifetime! Partly untarred roads take you first to Etosha wildlife reserve. Then ride on the edge between ocean and desert along Skeleton Coast. Eat Schwarzwalder Torte in Skwakopmund and apple pie in Solitaire. Ride to the heights of the dunes at Sossusvlei and to the depths of Fish River Canyon. Exchange Namibia for South Africa so you can take the empty R 355. Halfway down this road you will enjoy the most spectacular sunset over the Karoo. At the end of your motorcycle holiday you reach the impressive Table Mountain towering over Cape Town. On a terrace, nursing a glass of good wine, you will have to say goodbye to this unforgettable motorbike tour. Suitable for the more experienced rider, either with or without pillion. 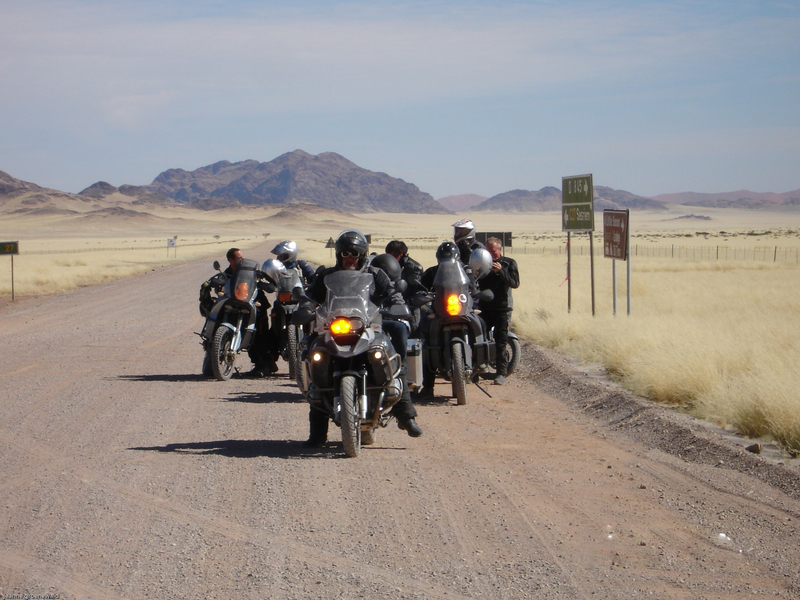 You ride the best tarred and untarred roads of South Africa and Namibia with this motorcycle tour. See Cape Town, Africa’s most beautiful town, from the top of Table Mountain. 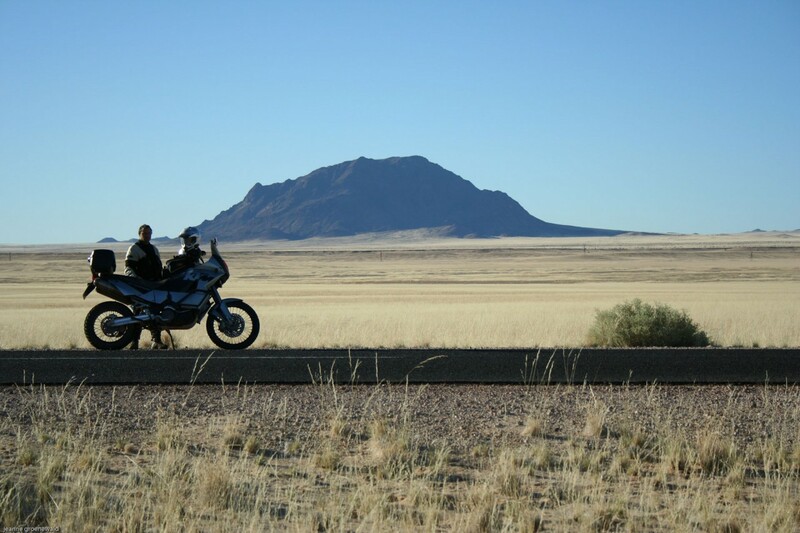 Motorbikers will enjoy South-Africa’s longest empty road to Tankwa in the middle of the Karoo. Enjoy here a spectacular African sunset over empty mountains. Next your motorbike holiday takes you to Namibia and the hundreds of metres deep precipice of Fish River Canyon. Climb the world’s highest dunes at Sossusvlei and then ride on to Swakopmund and the Cape fur seals along the Skeleton Coast. No motorcycle tour through southern Africa is complete without a game drive through the Etosha N.P. Rhino’s, elephants, lions, giraffes, antelopes and many other animals pass before your eyes. Suitable for the somewhat experienced rider, either with or without a pillion. Dreaming about a motorbike tour from one ocean to the other? Where else in the world can you do that except in South Africa. Ride on tarred roads from the Atlantic to the Indian Ocean through a magnificent landscape. 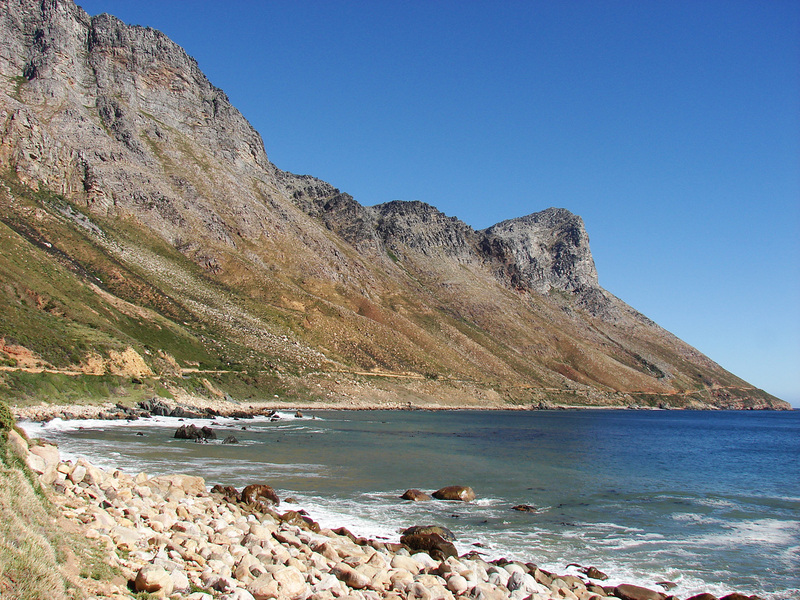 See mountain passes and vineyards, semi-deserts and wildlife reserves, ‘fynbos’ woodlands and rocky cliffs. Search for rhino’s and Cape buffalo’s, elephants, lions and giraffes, impala’s and other antelopes. Meet the friendly South African people. 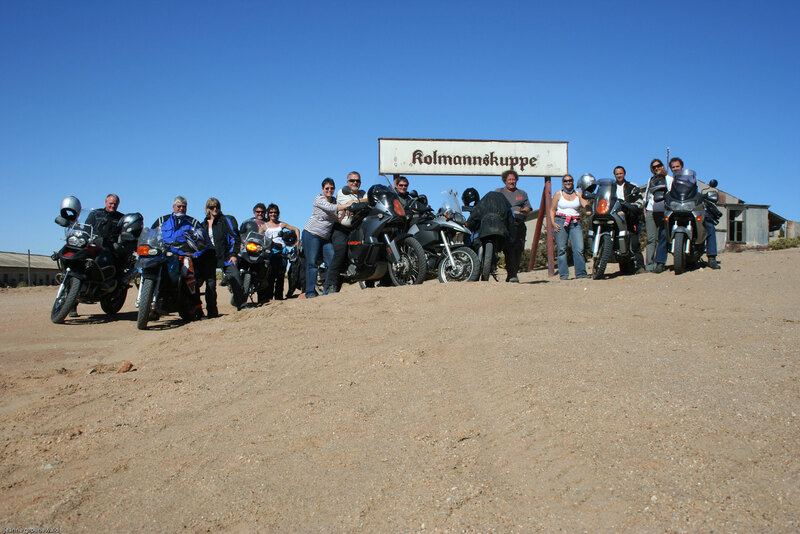 Your motorcycle holiday will take you to two capes: Good Hope and Agulhas. Your will ride curving mountain roads through the Cederbergen and along the Garden- and Wine routes. Follow the endless empty roads of Route 62 and the Karoo. Sleep in comfortable hotels. Eat one day game on a veranda in a game reserve and the next day calamari and crayfish along the beach. Sit in an outdoor cafe in historic towns like Capetown, Oudtshoorn and Stellenbosch. In short, the perfect motorcycle tour for every motorbiker, with or without pillion. You think a motorcycle holiday in southern Africa is far out, but have your own wish list? Or you want to do one of our tours with your own motorbike club? Or maybe ride longer, farther? Do you want to go to Augrabies, where the BBC series ‘walking with cavemen’ was recorded? Or play a game of skittles in the desolated, partly underneath sand buried ghost town of Kolmanskop? Maybe you want to ride Route 62 as well or incorporate the Garden Route in your motorcycle holiday? See more wildlife, or want to see less? At Ride2Roam we make it possible. Send us your wishes and proposed date or period and we will make offer you a custom made tour. We advise you have at least 4-6 participants, with less the costs of the tour will rise steeply compared to our fixed departure dates. You think a motorcycle holiday in southern Africa is far out, but have your own wish list? Or you want to do one of our tours with your own motorbike club? Or maybe ride longer, farther? Do you want to go to Augrabies, where the BBC series ‘walking with cavemen’ was recorded? Or play a game of skittles in the desolated, partly underneath sand buried ghost town of Kolmanskop? Maybe you want to ride Route 62 as well or incorporate the Garden Route in your motorcycle holiday? See more wildlife, or want to see less? At Ride2Roam we make it possible. Send us your wishes and proposed date or period and we will make offer you a custom made tour. We advise you have at least 6 participants; otherwise the price of the tour will rise steeply. What can I say…..??? Everything back to normal again!!! Contemplating and savoring the sunny relaxed days we had in Namibia…..!! What an experience!! Thanks to all for the fun time had, the laughs and chats – such a privilege to know you all (biker mates) and special times shared. Henk, a special thanks to you , we had an amazing time. What can I say….life is good!!! I had the time of my life, so thanks for making this an unforgettable trip!! Delanie and I will put a few pic’s together and give each of you a CD. This was a bespoke tour based on Henk Van Niekerks extensive knowledge of Botswana and Namibia. Well the trip exceeded all expectations: the sights were breathtaking and the biking a good combination of tarmac and good gravel. At first sight some of the daily distances looked quite daunting but most days we were drinking sundowners by 4 o’clock! This was a truly memorable trip and the constant smiles on everybody’s face confirmed that it was a very special event. That doesn’t really convey just what a good time we had but a lot of that was down to you and the gang on the trip!! From Stellenbosch a hearty thanks for the amazing trip. I thought I would phone the motorcycle company who sold the pants to me to tell them they’ve given me the wrong number – too small… but when I got onto the scale today I realized it was the great food we had on tour that was the culprit. Again a BIG thanks to you HENK!!! Well done Henk and Chris. Milly and I had a really great time and I thank those who supported her from time to time on the longer sections for your patience and with helping in the sandy sections, it is a real privilege to be able to do what we did in such beautiful surroundings, even with the odd paychderm close by, once we have go our photos to Elreda and Delani and they have finished editing you are most welcome to join us at our home for a Photo skop.